Member Don Green and Compatriots from other SCV Camps received Brigade Awards at the Quarterly Meeting at the Dixie Community Center near Hattiesburg, MS. on Dec. 11, 2009. 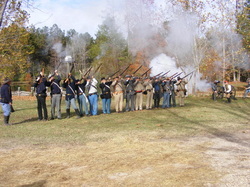 Camp #227 holds a skirmish each year as part of Landrum's Christmas Celebration. This firing squad above is made up of Compatriots who skirmished on November 28, 2009. 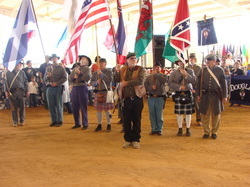 Camp #227 helps provide a color guard at the Highlands and Islands Games on Nov. 14, 2009 at the Harrison County Fairgrounds in Gulfport, MS.
Compatriot Don Green helped out with the SCV Camp #712 Crystal Springs living history at Grand Gulf Military Park near Port Gibson, MS. on Nov. 7, 2009. 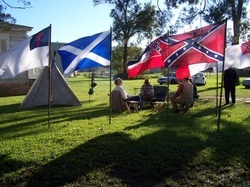 SCV Camp #227 Jones County Rosin Heels helped the local DAR Chapter with an encampment next to the historic Deason House in Ellisville, MS. as part of the annual Halloween tours on October 31, 2009. 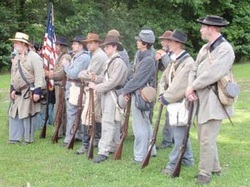 Members of Camp #227 fell in to form the 27th Miss. Inf. Co G at Fall Muster held on Oct. 18, 2009 at Beauvoir in Biloxi, MS.
Members Dennis Avera and Don Green helped with the "Pointy Sticks" Project at Beauvoir on Oct. 3, 2009 in preparation for the upcoming Fall Muster. 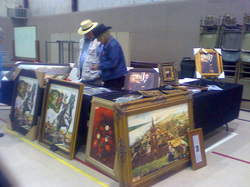 Artist Jerry McWilliams had his paintings on sale at the Southern Heritage Conference held annually by SCV Camp #227 at Bethlehem Baptist Church in Laurel, MS. on August 22, 2009. Member Don Green of Camp #227 took part in the re-dedication of a UDC Cross at the Thornton Memorial in Live Oak Cemetery in Pass Christian, MS. on July 25, 2009. Members of the Rosin Heels Camp #227 Don Gren and Joe Cosper fell in with the 46th Miss. Inf. for a weekend at historic Champion Hill on May 16, 2009. 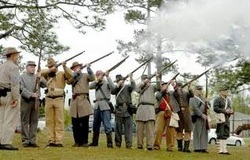 The Jones County Rosin Heels provided some troops for the firing squad at Compatriot Stone Barefield's burial in Hattiesburg, MS. on March 20, 2009. 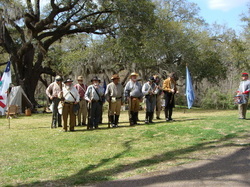 Members of Camp #227 helped form this firing squad at Routhland Plantation in Natchez, MS. on March 7, 2009. 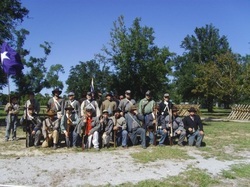 Members of Camp #227 helped form this color guard at Texas Hospital Memorial in Quitman, MS. on Feb 21, 2009. 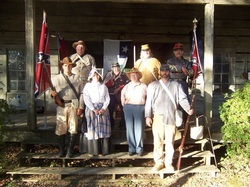 Members of SCV Camp #227 posed for a pic with the SAR Chapter from Laurel, MS. at a YWCO Dance on Feb. 14, 2009. Members of Camp #227 helped to form this massive honor guard at the New Augusta Memorial for Sgt. William M. Stevens on Feb. 7, 2009 at Prospect Cemetery near New Augusta, MS.